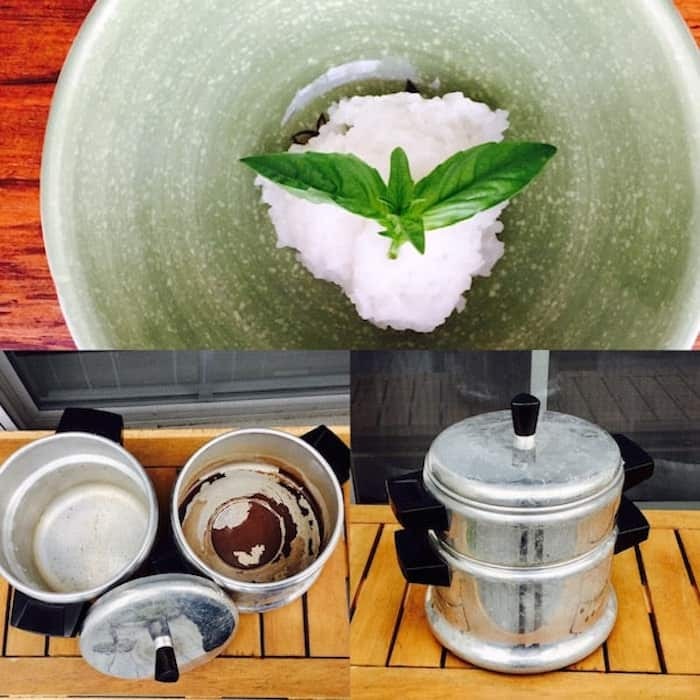 How to Make Sticky Rice With Sweet White Rice, just lie in the Asian restaurants. There’s a trick. Sticky Rice tastes slightly sweet and is, wait for it…sticky! Hi. It’s Lois at Recipe Idea Shop, telling you how to make Sticky Rice. Have you ever wondered how Asian restaurants make their rice so sticky? That doesn’t happen when you make white rice at home, does it? It does if you use the right rice and you soak it overnight. 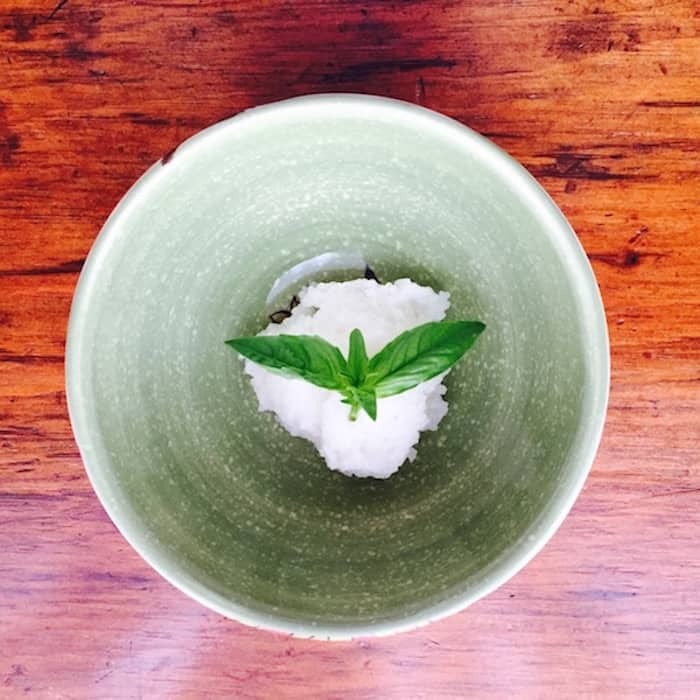 Sticky Rice is made with a glutinous white rice (but it doesn’t contain gluten). 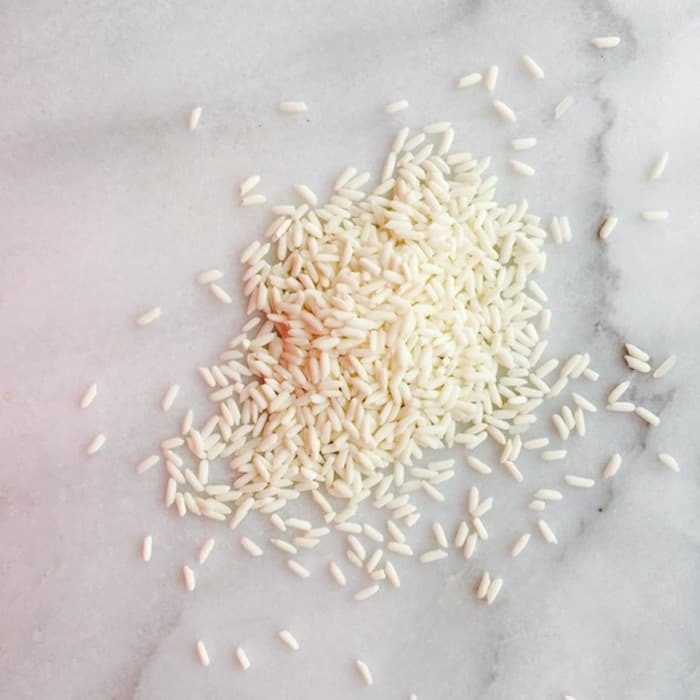 The rice looks different than other types of white rice; it has a dull, white patina, rather like the outside of a coated aspirin. It’s also a little bit fatter. Sticky Rice has a dull white coating and is a little bigger than long grain white rice. I haven’t seen this type of rice in the supermarket, but then, I haven’t known what to look for. It’s not marketed as “sticky rice.” Don asked the clerk at the Oriental Market in Harrisonburg about it. The woman explained that it’s a special kind of rice; she sold him some and told him to soak it overnight and then “cook it like regular rice.” It worked perfectly for him in our rice cooker, but he forgot to take a picture. Sticky Rice is actually called Sweet White Rice. If you look for gluten free flours, you’ll easily find Sweet Rice Flour. Even though it doesn’t contain gluten, because of its high stickiness factor, it grinds into a good flour that mimics wheat flour (which contains gluten). Sweet Rice Flour is a good option for thickening gravies and sauces. I find it a bit grainy for baking, however. Because Don didn’t take a picture, I made it again. I used the rice cooker, but it came out a mushy, globby mess because it didn’t seem done and I added a bit more water at the end and then cooked it too long. Here’s what I learned: (1) soak Sticky Rice overnight; (2) use 2 cups of water per cup of rice; and (3) don’t overcook it. It takes about the same amount of time (around 25 minutes) to cook this rice as it does for any white rice. The next time I used a regular covered pot (the way my mom made rice), and it was perfect. The photo below shows what our rice cooker looks like. It has been in the Crawford family forever, and I doubt that you could buy a new one today. It works well for long grain white rice, but I don’t have good luck making any other kind of rice in it. Have you used this kind of rice cooker? Or do you have an electric rice cooker? This is the only rice cooker we have, but I have heard the new, electric rice cookers work great for all types of rice. We don’t need another appliance, and a big, rice cooker would make way too much rice for the two of us so I won’t get one anytime soon. 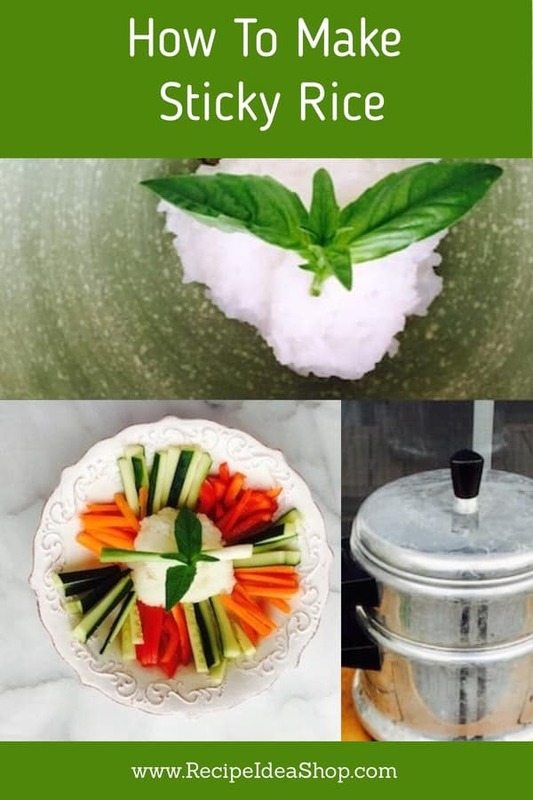 ld-fashioned double boiler Rice Cooker and Sticky Rice. Sticky Rice is delicious with any kind of sauce. It’s a terrific alternative to potatoes. According to Don, Sticky Rice is one of the reasons we lost the Vietnam War. 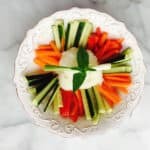 The Americans had to stop to eat regular meals, which took time, and the Vietnamese soldiers carried nutrition Sticky Rice Balls with them to eat whenever they needed a bit of sustenance. All kinds of rice provide protein, carbs and other nutrients. Some, such as Brown Rice, have more fiber and take longer to digest (making them lower glycemic index and therefore better for diabetics). I like most types of rice, but I use them for specific purposes. I prefer Sticky Rice or White Rice with Stir Fry. Basmati Rice is good for Lemon Rice or Cinnamon Sugar Rice. Jasmine Rice (which smells amazing when cooked), Brown Rice, or Red Rice are all good served cooked, alongside a meat or poultry entree. Rice that is called “Wild Rice” is often a mixture of several darker kinds of rice, such as Brown, Black, and Red Rice. Arborio Rice is used to make Risotto. 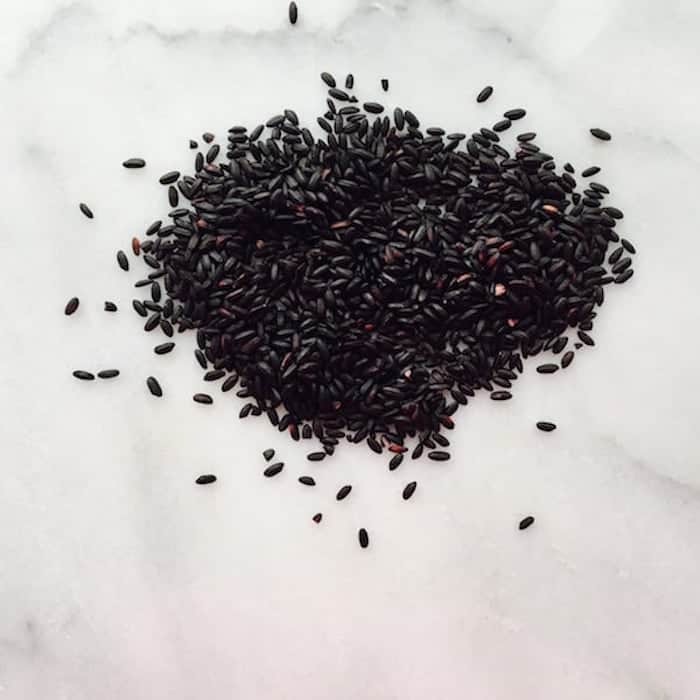 Black Rice made with coconut milk is fabulous as a dessert. Each type of rice has a little different flavor. White rice is generally mildly flavored; darker ones often have a nutty flavor. What’s your favorite? 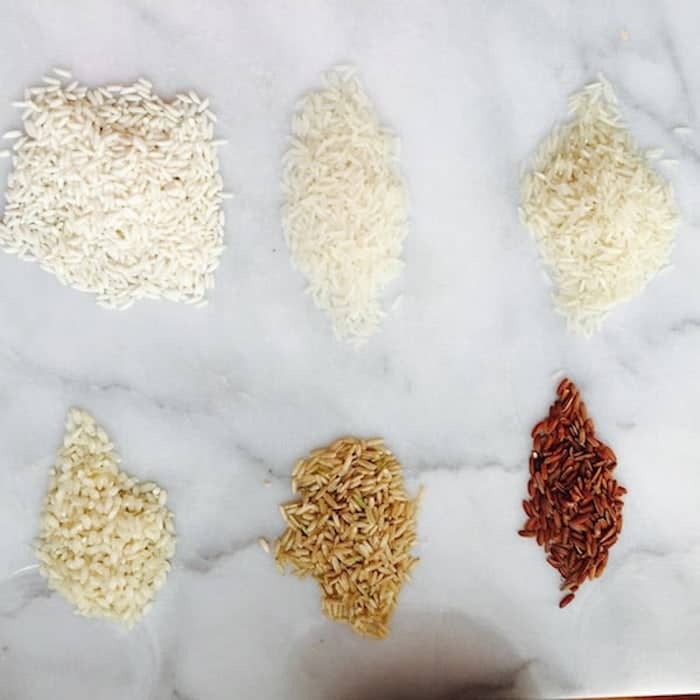 Top Row: Sticky Rice, Jasmine Rice, Basmati Rice. Bottom Row: Arborio Rice, Brown Rice, Red Rice. Simple tools are required for this recipe: a strainer (to rinse the rice), a rice cooker or covered pot, and a measuring cup. What would you use? CHICHIC Set of 3 Stainless Steel Kitchen Fine mesh Strainers Tea Fine Y Mesh Strainers Juice Egg Filter 3 Sieve Colander Sets Wire Filter Mesh for Tea Coffee Food Rice Vegetable with Handle. Buy it on Amazon. Instant Pot IP-DUO60 7-in-1 Programmable Pressure Cooker, 6qt/1000W, Latest 3rd Generation Technology, Stainless Steel Cooking Pot and Exterior. No need for multiple appliances, buy this on Amazon. Soak the rice overnight in 2 cups of water. Bring the water and rice to a rolling boil. Reduce the heat to low and cover the pot. Cook for about 20-25 minutes until the water is absorbed and the rice sticks together and is soft. Do not overcook or it will be mushy. Sticky Rice Nutrition Label. Each serving is 1/2 cup.